I love coupons, and if you've been reading this blog for a while - you'll know I rarely buy something without one! 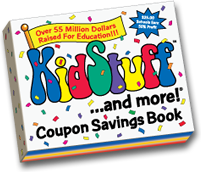 So I was thrilled to hear about KidStuff Bargain Books -a book full of coupons for stores like Burlington Coat Factory, Yankee Candle, Sherwin Williams and more! The book includes coupons for local restaurants and chains like Acapulco's, Dunkin Donuts, Wings Over and more! It also includes coupons for local events and activities such as Six Flags, Southwick’s Zoo, Boston Celtics, Quassy Amusement Park, Water Country and more! KidStuff Bargain Books are a great way to fundraise at your school. Each coupon book sells for $25 and earns up to 50% profit ($12.50 or more for each book sold!) And for every five sold, the individual/family receives a free book! Interested? It's easy to set up a fundraiser and requires no up front cost, or minimum sales. Most coupons are valid from Sept. 1, 2014 through Dec. 31, 2015. Families quickly save more than the $25.00 cost of the book with great coupons for shopping, family activities, and food! These also make great gifts for family, friends and just about anyone else! Interested in setting up your own Bargain Book fundraiser? Click here to find out more info! Live!, Disney On Ice, Sal’s Pizza, Bickfords Grille, Ixtapa Mexican Grill, Nathan’s, Zaftigs, Stone Hearth Pizza, Denny’s, Papa John’s, J.P. Licks, and hundreds more - visit www.KidStuffCouponBook.com to see the full list! Verdict: I'm really enjoying using these coupons and have started keeping my book in the car so I always have affordable options for dinner! I really like that there are coupons for some of the places I love to shop but don't always have coupons for. It's a great way to save some extra money and with Christmas coming up they will come in handy! The Party City coupon. With the kids birthdays relatively close together, I feel like I spend a small fortune there! I could use the Six Flags coupon as they are now open year round at the one near us.